Four years and still going strong, Synerion has been giving back to the local community by sponsoring various youth hockey teams in the Brampton Youth Hockey Association. 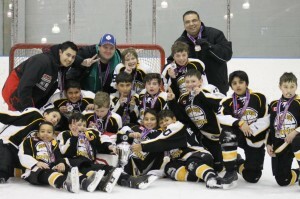 The Brampton Snipers (an Atom-level boys hockey team) coached by our very own Mark Patte for the 2012-2013 season, took to the ice for their semi-final game against the Brampton Spitfires just two weeks ago. After losing their head coach mid-season, the Snipers bounced back to play a phenomenal regular season which resulted in being tied for first place overall. With captain Ethan Jarvis scoring 35 goals, and goalie Sebastian Carabott ending the season with an excellent GAA score of 1.4. The Snipers, who maintained an undefeated record against the Spitfires, were looking to defeat their rivals once again and clinch a spot in the finals. After both teams playing an excellent and very close game, the Snipers suffered a big upset in the end, losing to the Spitfires 3-1. The Brampton Snipers will be wrapping up their season in the Mississauga Reps Tournament April 5th, 6th, & 7th at Westwood Arena in Etobicoke. Go Synerion Snipers!